Shih Tzu Mixed Candle Topper Tiny One "A Day on the Farm"
Home > Dogs All > Shih Tzu Mixed > Shih Tzu Mixed Candle Topper Tiny One "A Day on the Farm"
The Shih Tzu origin may never be 100% clear, some believe it is China, while others are just as certain it is Tibet. One thing is clear, however, the breed is ancient. The name Shih Tzu translates to “Lion Dog” and while this breed is friendly and jolly, they are not afraid to stand up for themselves. This breed was the house pet to have during most of the Ming Dynasty. As per the AKC registration statistics, the Shi Tzu continues to rake very high in popularity. Their long double coat can be any color and while it is shown long in the ring, many people enjoy the shorter puppy or sport cuts instead. This little dog requires minimal exercise and enjoys spending time with family. The Shih Tzu has gone by several names including Chinese Lion Dog, Chrysanthemum Dog and Tibetan Lion Dog. The Average life expectancy ranges from 10 to 16 years old. The AKC recognized the Shih Tzu in the Toy Group in 1969. The average size ranges from 8 to 11 inches tall at the withers with a weight of 9 to 16 pounds being preferred. 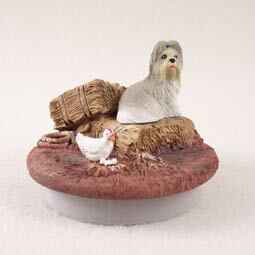 The Candle Topper “A Day on the Farm” features one of 218 dog breeds, hand painted tiny one figurines, sitting on a bale of hay, watch a hen on her nest. Every detail looks like it’s so real the dog or chicken might jump off the topper and walk away. Designed to fit the standard candle with a 2 15/16” opening, this unique stone resin sculpture is sure to be the light of your life. (candle not included). Makes a perfect gift or addition to your store.